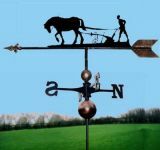 Each "Traditional" Original Forgery weathervane is manufactured by hand and based on designs from long ago. 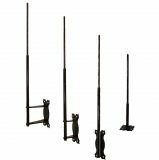 Each Cardinal assembly ( NSEW ) is made from 16mm x 8mm solid bar scrolls finished with a forged flair at each end. These are then welded to a central hub which includes two locking collars to secure the cardinal to the mounting post. 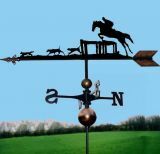 Each vane features a balanced motif & arrow assembly measuring approximately 32" - 36" across (depending on the design). This pivots on a hardened ball bearing giving very free movement. The "Orbital" features a newly designed Cardinal ( NSEW ) assembly complemented by an upper and lower steel sphere. 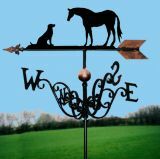 Made by hand, this vane uses 5mm solid steel elements in its construction and like its "Traditional" brother uses two locking collars to secure it to the mounting post. 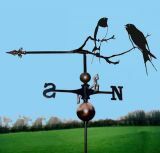 Although this cardinal is physically smaller than that used in the "Traditional" both weathervane designs use the same size of motif. 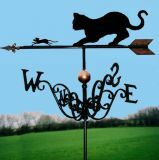 Each weathervane is finished by firstly shot blasting all the components before applying a coat of etching primer. Finally a thick finishing coat of semi-gloss black is applied and baked on. The spheres, point & tail flights are then highlighted with a copper patine to create a stunning weathervane. Please see the mountings section below to help choose the correct mounting post required and select from the drop down menu on each design page.